Found this beauty early this morning with my detector. The small catch had a whale oil lamp. (crunched) and this glob top Cartan & McCarthy Co. That was it....You know, it never gets old seeing a bottle come out of the ground . This is a revised copy of the post that Blake Peterson sent to me a few days ago. I jumped the gun and posted the rough draft instead of the finished product. My apologies to Blake. He has added additional text and several pictures that I left out of the rough draft. Enjoy! In the early 1870’s, Eureka Nevada was growing towards what it was to become, another of Nevada’s great mining towns. The first smelting plant built in 1869, was a failure. But another, built in the 1870’s, was far more successful and the very forerunner of even more advanced methods. Soon, the nearby hillsides of Eureka ranked as Nevada's second-richest mineral producer (behind the Comstock Lode), particularly for lead, with small amounts of silver. By 1874, the population of Eureka was nearly 6,000 people. Eureka and the surrounding mining communities have seen more than their shares of bottle diggers. Both local residents and collectors from the surrounding western states have dug it hard since the 1950’s. Today, after all the years of digging, there is very little left that’s un-dug. Some opportunities in life may present themselves but only once. This dig is possibly one of those. The property was temporarily vacant. The owner is a very close friend, and gave us permission to dig. And last, the fact that John, Phil, Dan and I were able to take time away from work to dig. We spent nearly eight hours every day for a period of two weeks digging this lot. We were getting close to completing a thorough search of the property when, on a cold and windy April fool’s day, a cellar or possibly a basement was discovered. The room had been filled in level many decades ago and was discovered on the back corner of the lot near the creek channel. It was approximately ten feet wide, twelve feet long, and over eight feet deep. On the bottom was a hard silt layer over eighteen inches thick, which had washed in from the first flood. (Through-out the lower properties of town, It’s common to find a silt layer in all holes that were dug before the 1874 flood.) Above that was a sand and gravel layer from possibly the second flood, then rocks and filled material to the surface. There was very little trash in the fill to the surface of this cellar, just a few bottles and some trash from the mid-1870’s in the sand and gravel layer. But under the silt layer on the bottom contained the real treasure. Along the wall from a doorway that exited toward the creek to the North wall and across the floor toward the center, were full bottles and demijohns of wine and bitters laying on their sides. Many were side by side touching each other; others were up into the silt as if moved around by the turbulence of the flood waters. 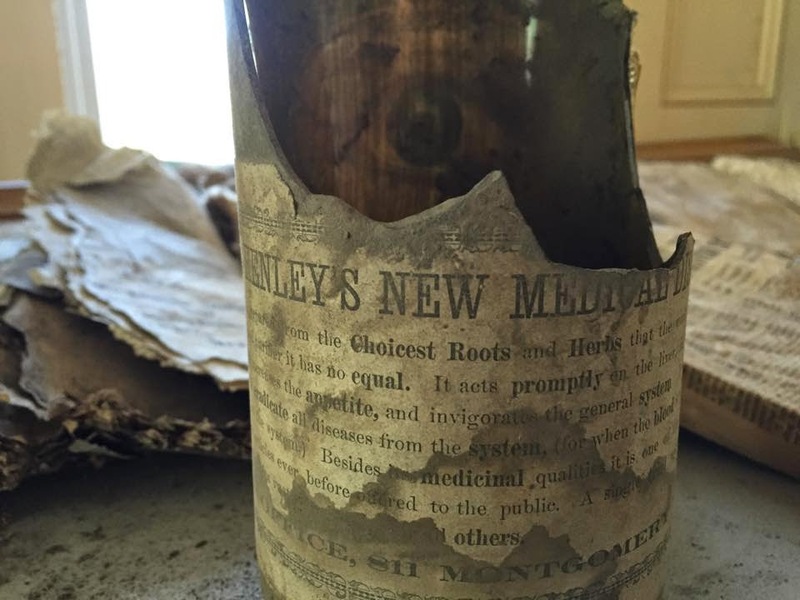 After being preserved in the silt of a cool cellar for over 140 years, we recovered six embossed Dr HENLEY’S WILD GRAPE ROOT IXL BITTERS bottles (variant 2 & 3), all with contents. Three IXL bottles are full up into the neck; the other four appear to have been opened with some contents removed, or possibly the cork failed and some contents escaped. . Four additional IXL’s weren’t so lucky and were broken under the weight of big rocks. 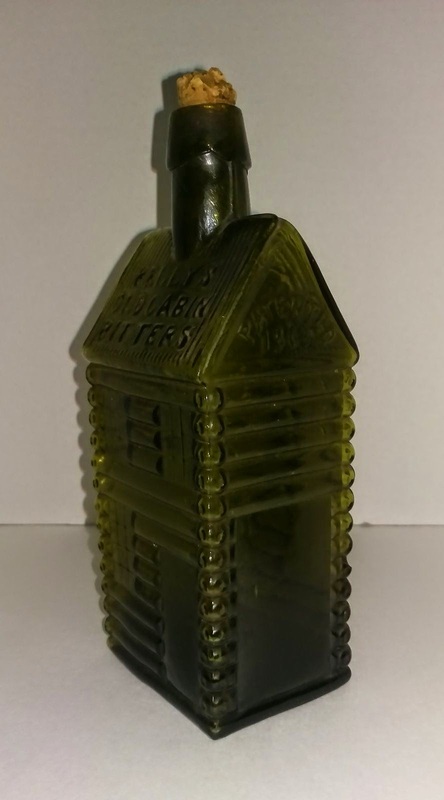 Theirs was a lime green very crude un-embossed bottle with the same shape and size as an embossed IXL in the cellar, also corked with full contents up into the neck. I say was, because we cleaned & removed the cork, poured a few shots, and had a taste while dividing the bottles. It is very pleasant and flavorful. This bottle with contents has gotten a new cork and is being stored for future tasting, along with the wines and IXL bitters in a nice cool wine cellar. There were a half dozen bottles of wine with full contents buried in the silt. The demijohns weren’t quite so fortunate—they were still corked but empty, and were cracked and broken in place. The silt which was set up hard as stiff clay, held the demijohn bottle together. We recovered over five hundred intact bottles on this dig, with about two thirds of them being collectable bottles. 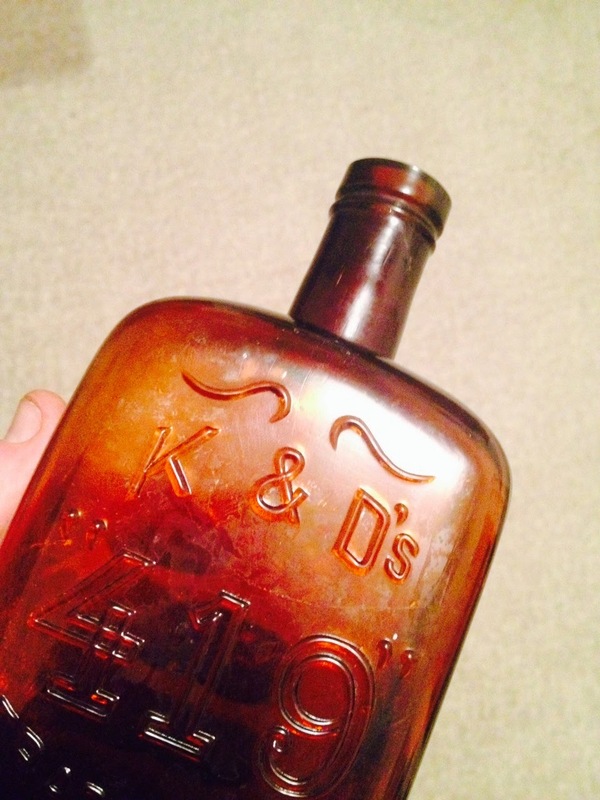 Besides the bitters, there are whiskies, sodas, inks, patent medicines, pharmacy bottles, and food containers. Its fun to complete a dig and have enough quality bottles to see everyone involved walk away happy and content with their selection from the pick. Two IXL’s from the picture above after washing, picture taken in natural sunlight. Thanks Blake for this fantastic post! 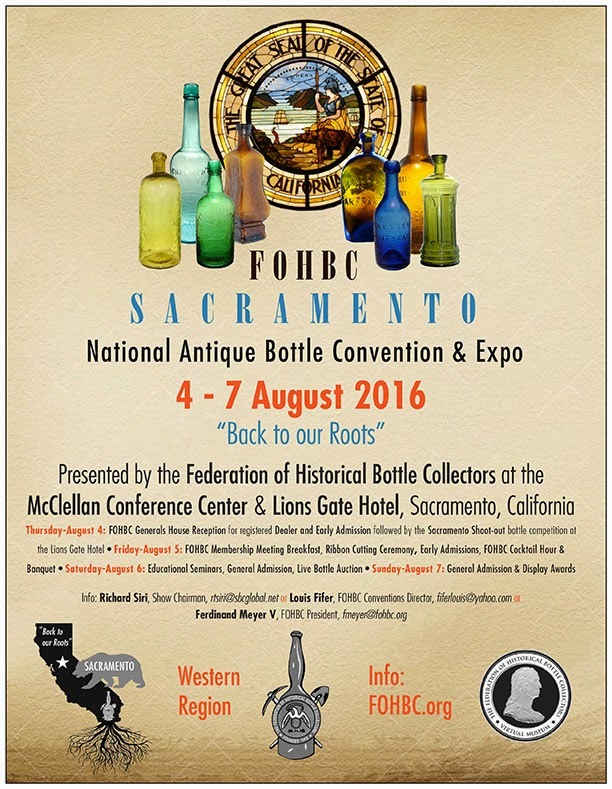 I am currently assisting Richard Siri in booking seminars for the 2016 Federation of Historical Bottle Collectors (FOHBC) Expo which will be held in Sacramento on August 4-7. As show chairman, Richard has a huge task ahead of him, and I am hoping some of you will be able to help him, even in a small way. I am inviting anyone who has special knowledge of bottles and glass to participate in heading up a talk (we are calling them seminars) that may have interest to fellow collectors or students of glass. Many of you carry a vast amount of unique knowledge that could be lost forever, so now is your chance. I especially invite those of you whose interest is West Coast in nature. After all, this is a Western Region Expo and we need to show the rest of the country what we know about our own region. I don't mean to belittle subject matter that is not western in nature, as this is a national event, and all parts of the nation and world are invited to participate. I do believe that seminars are under-rated at bottle shows, and the annual Expo is really the best way - notwithstanding this excellent blog site, to communicate in such a great interactive environment. 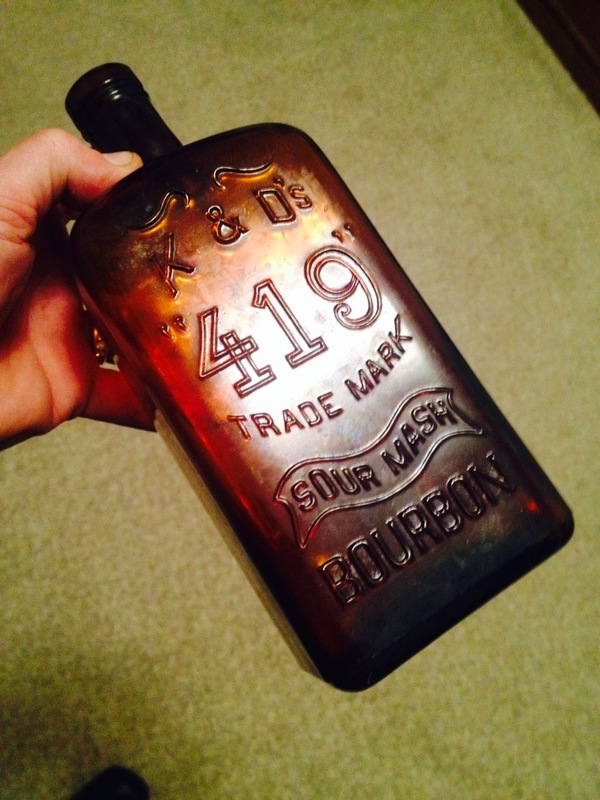 Seminars could include showcasing bottles in your collection, either by example or photograph. One could simply talk about memorable digging events, either in photograph or tale. One could present a talk with a focus on one or a few businesses that used bottles. 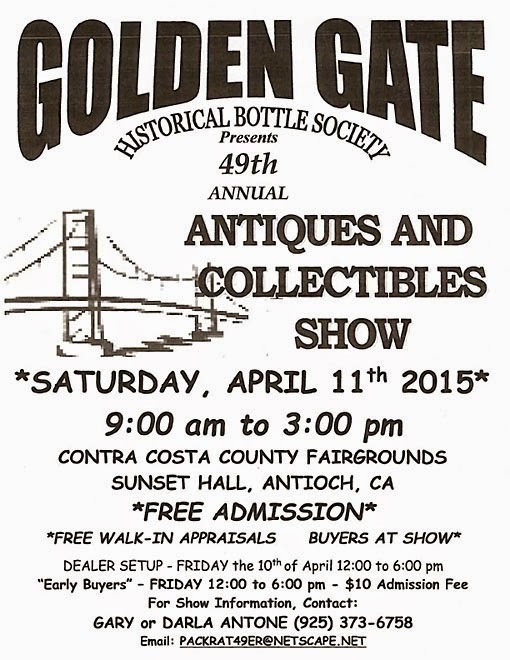 And, of course, one could showcase a particular class of bottles, such as ink, beer, soda, whiskey, etc. For those who have visited a number of glass or bottle displays, a talk about different museums and what they have to offer, would be a fascinating subject. Showing examples of bottle related paper items and advertising is always an interesting subject. Another idea could be an interactive discussion about a bottle related subject of your choosing, and you would simply be a facilitator. Or, just be creative. There are far more possibilities than I can think of. I also believe that a full range, from academic to humorous should be offered. The FOHBC Board maintains the right to reject any seminar proposals that are not in keeping with their own values and what it perceives is best for the FOHBC, but I wouldn't expect people to get too crazy. I hope you can all appreciate the value of having such an event here in California and I invite all of you to consider adding an interesting dimension to the Expo by giving a talk on a subject . There are only five spots left, so I suggest you respond in a timely manner. 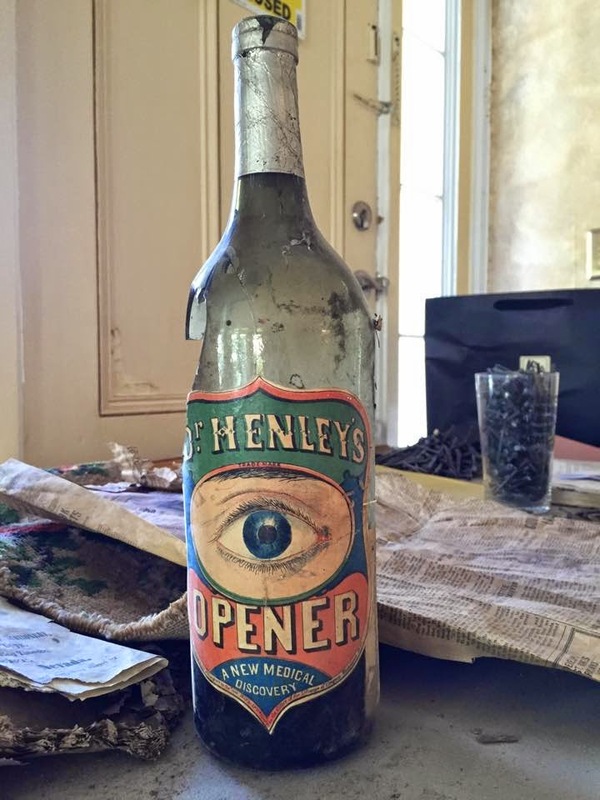 From what information I can gather from the labels the Eye Opener was a medicine NOT a bitters. 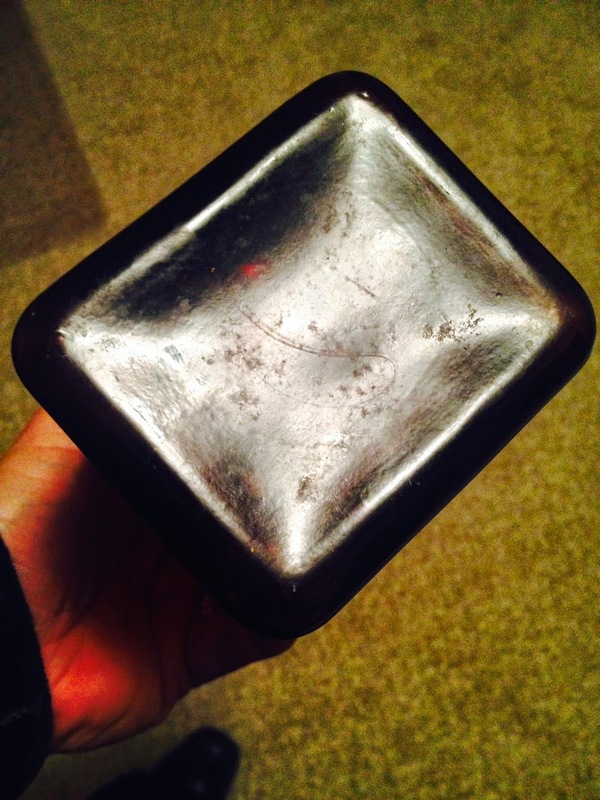 Here's a recently unearthed flask that I have never seen. 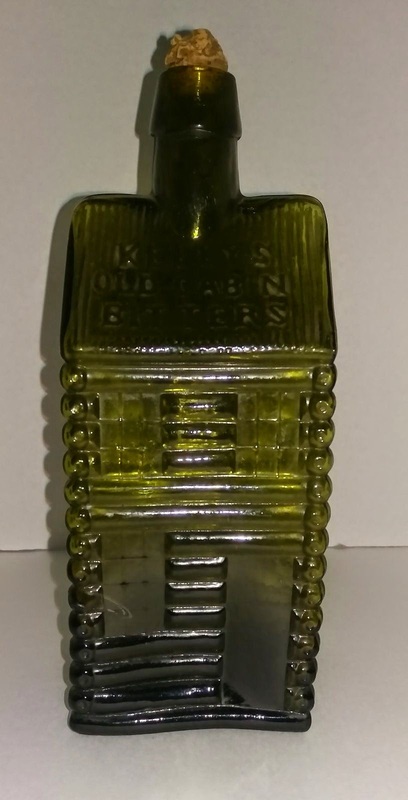 I am not sure but from the embossing and the neck and top treatment this looks like a bottle from Canada to me.